I couldn't wait too long to wear the red version of the black & white dress from the other day. 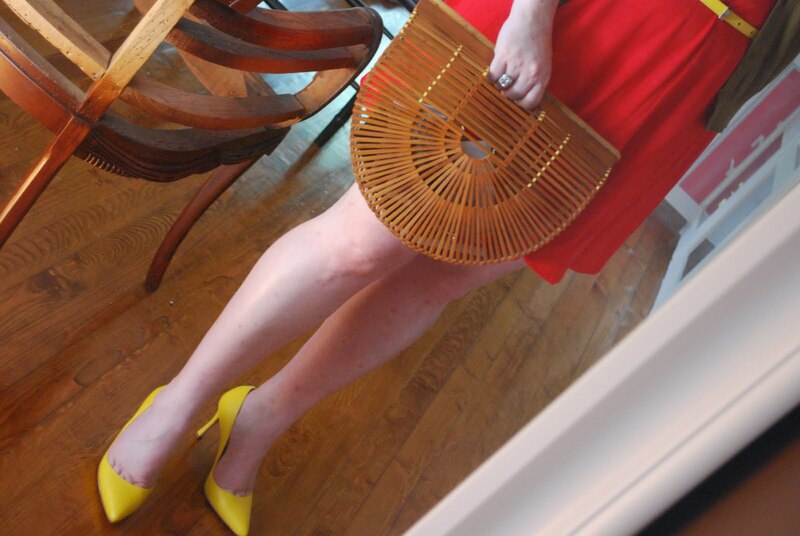 I paired it with an olive embellished cardigan, also from Target, a skinny patent yellow belt and this cool vintage purse. The purse was from an antiques fair I go to twice a year. There a few favorite vendors that always have the best stuff. The purse is strips of wood and opens from the top. Perfect to take to our group lunch event. 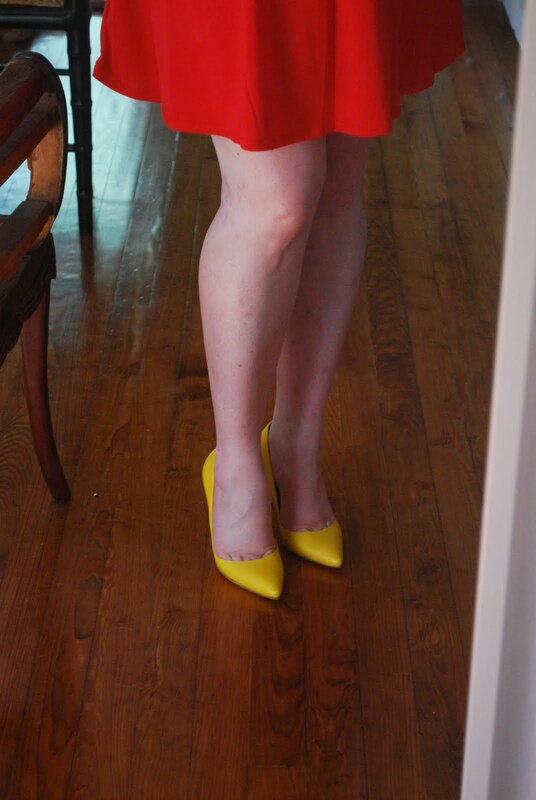 The heels are Manolo Blahnik Uliepes - the perfect pump - and an awesome yellow. They're so pretty I took a bunch of shots so they'll get a post of their own. I had to redo my nails so I chose a neutral dark taupe - Zoya's Pasha. It's a bit conservative for me so I'm not sure it'll stick around for too long. This was for a group lunch with folks I hadn't met before. Fun, comfortable but with some interesting color matching. I hope I don't bore you, because I love these two dresses and they are going to be fun to play with. The dress looks great with that cardigan. love this color combo! It really works. That purse is so unique! I just came across your blog! So I randomly inherited this exact same wood purse. Did the seller share any history or information about this piece when you purchased it? I'm really interested about it since it's so unique. Tempted to sell it but don't know about it's value.